The Albertina is dedicating a comprehensive exhibition to the great Renaissance painter Raphael. Together with Leonardo da Vinci and Michelangelo, Raphael (1483-1520) completes the great triumvirate of the Renaissance. His drawings made him one of the great draftsmen in art history. On display in the exhibition are 150 works - from initial sketches of ideas via detailed and compositional studies through to paintings. They are intended to explain Raphael's thinking and conceptional approach. 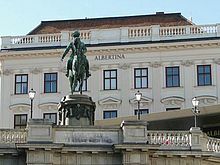 The inventory owned by the Albertina is supplemented with loan items from world-famous museums, including the Uffizi, the Louvre, the Vatican Museums and the Royal Collection of Britain's Queen Elizabeth II. Raphael was a universal genius of the High Renaissance: He was a painter and architect in Florence and Rome (including as site manager on St. Peter's Basilica) and worked on behalf of popes and princes. His works express a constant search for the balance between the imitation of nature and the ideal image. The exhibition highlights all periods of Raphael's creative work: from the early Umbrian period (to 1504) via the years in Florence (ca. 1504-1508) to the Roman period (ca. 1508-1520).